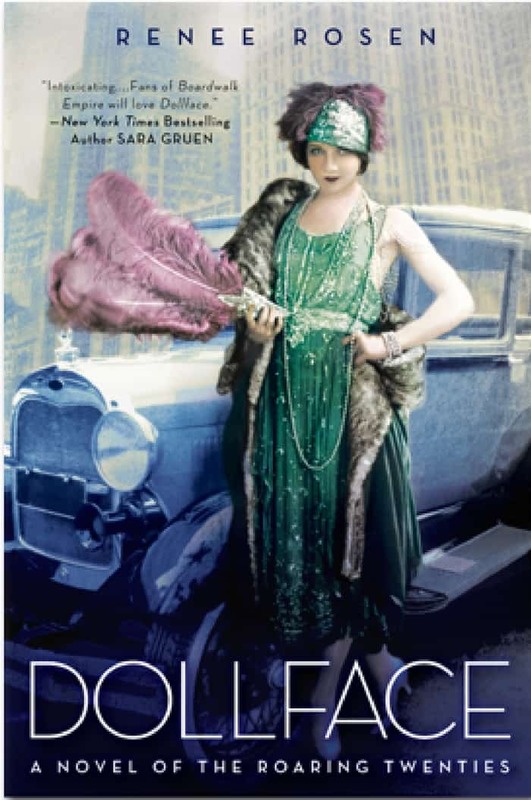 D ollface is Renee Rosen’s second novel, set in 1920s Chicago, a fascinating era when jazz, Prohibition, and gangster life took center stage. I found the premise irresistible: it’s seen through the eyes of women. Not the mobsters, but the women who love them. Not the clichéd and macho Godfather-Goodfellas-Scarface saga, but the women’s side of the story. Between romantic conflicts and gang wars, Dollface is packed with tension in every chapter. When Vera and Evelyn get first enter mobster society, they meet other wives and girlfriends and live a life of luxury. For a while the two friends manage to stave off the reality of their lovers’ professions, but when gang members start getting gunned down, and their new women friends end up widowed, they realize they can’t keep up the pretense any longer. In fact, to survive and protect the ones they love, they must take some risks of their own. I loved how Rosen makes 1920s Chicago come to life so intensely, whether it’s speakeasies with glittering crowds and loud music, stench-filled warehouses in the meatpacking district, or formal tea rooms of great hotels where Vera and Evelyn pretend to be real ladies. But it’s Vera’s transformation from working-class girl to glamorous flapper and mobster girlfriend that I found exceptionally well-written. Driven by her need to distance herself from her mother and the family business, Vera initially changes her appearance in pursuit of a different life. Soon however, the lifestyle she falls into changes her, and circumstances push her along a different inner journey that brings her full circle to her past. Dollface kept me turning the pages until its satisfying conclusion. While Vera’s dilemma revolves around her relationships with two men from rival gangs, I also found her relationship with her childhood friend Evelyn both moving and delightful. Yes, Rosen has devised a conflict for Vera that keeps us turning the pages. One man is dependable and devoted to her, the other is impulsive but she can’t turn off her physical attraction to him. It can’t go on like this. When I examine Vera’s two romances however, I can’t help but feel that if she didn’t have Evelyn’s friendship as a foil, Vera’s situation would feel less credible. Evelyn’s presence highlights two things that strengthen Vera’s motivations. We remember how young she really is. Vera supports herself, goes dancing in nightclubs, drinks, dates dangerous men, and puts on a sophisticated façade. Vera is also only 18 years old at the start of the novel. The main events unfold over five years so she is still quite young by novel’s end. Many of her decisions (or indecisions) reflect the naïve arrogance of youth. She thinks she can handle the situation. Remember when we were 18 and thought we knew it all? But the scenes where Vera and Evelyn break into giggles reminded me that they are nowhere as mature as they appear – and fully capable of the mistakes of youth. We understand she is essentially a loyal person. Vera gets exasperated with Evelyn’s choices but would never abandon her friend. Her relationship with Evelyn show us the depth and quality of Vera’s character, which helps us understand how profoundly agonizing it is for her to love two men, and what it costs her to resist -- as well as give in. “Show, don’t tell” has got to be one of the Five Most Frequent Criticisms we writers hear at workshops, an exhortation to convey a character’s mood or personality through indirect means. To me, ‘indirect’ once meant describing facial expression, physical gestures, or tone of voice. Not that sophisticated, I’ll be the first to admit. Rosen uses Vera and Evelyn’s friendship as part of the plot, but also as a vehicle for communicating personality, motivation, and maturity. It’s indirect and it’s effective -- even though you don’t realize it immediately. As I work on my next novel, I will look for opportunities to use relationships as a way to reveal more about the characters. Thank you, Renee! NOTE: This blog was migrated from an older website and comments didn't survive the trip. Feel free to repopulate the comments!